Nathan Bedford Forrest – Dwonna Know What I Think? Dwonna Know What I Think? Is Cutting Ties with the “Dukes of Hazzard” and the Confederate Flag Just, “Pulling the Knife Out”? Can I make a suggestion for a possible Dwonna Knows?? What about these outer moves around the battle flag? Taking “Dukes of Hazzard” off the air, the bust of Nathan Bedford Forrest in the state capital, and now Memphis voting to remove his remains. Are these justified actions or just knee-jerk? I’m not black, so I don’t know. LOL! 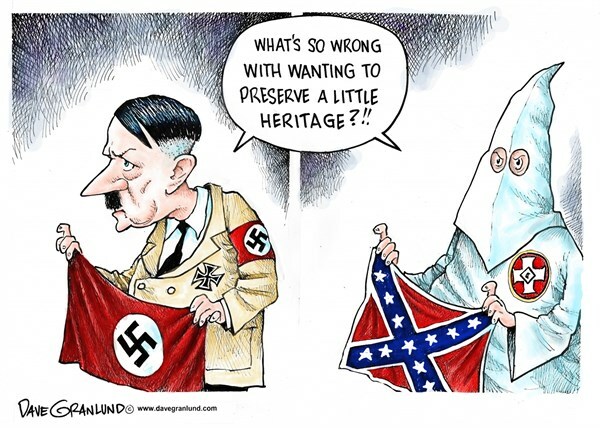 Still, there are those who still argue that the Confederate flag is about “heritage and not hate” even as they are presented with evidence to the contrary. As one white woman wrote on Facebook, “It’s the Rebel flag!!!!!! People are killing me. It’s not the damn confederate flag!!!! BTW mine should be here today or tomorrow.” These white folks continue to ignore the South’s heritage of slavery, Black Codes, Jim Crow segregation, lynchings, the Ku Klux Klan, the White Citizens Council, George Wallace, Bull Connor, and random acts of violence toward black men, women, and children. Why do these people refuse to acknowledge that the heritage about which they are so proud mostly centers around the enslavement, abuse, and terror of an entire group of people? Dylan Roof—and other white supremacists—used the Confederate flag as a symbol of their hate because IT IS A SYMBOL OF HATE. Ask the KKK why they waved the Confederate flag at its rally in Columbia, South Carolina. Ask the folks in Oklahoma why they waved the Confederate flag as President Obama’s motorcade drove by. Ask the 28-year-old white man who said in a radio interview that the Confederate flag represents white heritage and his desire to protect his white supremacy and that he didn’t care who it offended. Though I’m certain there are a few Confederate flag lovers who are not avowed racists and who truly believe that this battle flag represents a sanitized version of southern pride to which they so tightly cling, it does not change the fact that the Confederate flag is also a symbol of treason, a symbol of slavery, a symbol of Jim Crow, and very proud symbol embraced by the KKK, white supremacists, and Neo-Nazi groups. The State of South Carolina did remove that flag, and though many people argue that its removal is symbolic and does very little to change the long-standing race problem we have in this country, it could be a watershed moment. For the first time in a long time, white people of conscience are standing up to other white people and demanding that symbols of hate be removed from public display. Unfortunately, at the same time, white racists—and their apologists—feel more emboldened to say what used to be inappropriate to say in public. There is no shortage of nasty and vitriolic comments being directed at people of color, all because those of us of conscience have requested that a symbol of hate be removed from public display. So, is it a knee-jerk reaction that TV Land has removed the “Dukes of Hazard” from its lineup? Is Memphis’s desire to dig up Nathan Bedford Forrest’s (and his wife’s) remains from Heath Sciences Park in downtown Memphis as well as remove his statue an exercise in futility since it probably won’t change how blacks and whites interact with each other? Maybe these are knee-jerk reactions, but it’s long past time for these Confederate symbols to be moved to where they have always belonged: in a history museum. Though the “Dukes of Hazard” might seem like an innocuous 1980s sitcom about rural white southerners, its proud display of the Confederate flag and other Confederate symbols normalizes its place in American society and gives tacit approval to its hateful meaning. No, the Confederate battle flag in and of itself won’t “harm” anyone, as someone posted in response to my last column, but symbols do have very powerful meanings, and they do send intended and unintended messages to those who encounter them. As my father used to tell me when I wanted to hang out with the “bad” kids in the neighborhood, “You’re known by the company you keep.” Just ask the KKK or any white supremacist what the Confederate flag means to them and how they have draped themselves in that meaning to try to change how people of color are treated in American society. Symbols convey powerful messages without a single word ever being spoken. Malcolm X once said, “If you stick a knife nine inches into my back and pull it out three inches, that is not progress. Even if you pull it all the way out, that is not progress. Progress is healing the wound, and America hasn’t even begun to pull the knife out.” By taking steps to remove these symbols of the Confederacy from public display, America is, in a small but significant way, beginning to “pull the knife out.” Is this progress? A little. It’s also a good first step toward healing the wounds that continue to divide black and white America. We do not live in that post-racial society into which many had hoped President Barack Obama’s election would usher America. America is still a racist society where tangible progress has been made, but we have a long way to go to becoming a place where all people will be judged “not by the color of their skin but by the content of their character.” If nothing else, these oftentimes difficult discussions about the “Dukes of Hazard” and the Confederate battle flag are showing the world just how stubborn (i.e., ignorant) some white folks can be while also showing us how willing others are to embrace a more inclusive—and a more kind—society where symbols of hate are removed from public display. A blog on atheism, writing, and dogs. That will be an experience!